Bach's organ works are among the most frequently recorded. The catalogue includes several complete recordings, mostly by one organist. Among those who have recorded oeuvre in full are such distinguished musicians as Ton Koopman, Bernard Foccroulle and Gerhard Weinberger. When Brilliant Classics released its Bach Edition in 2000 it included a recording by the Swedish organist Hans Fagius, previously part of the BIS catalogue. 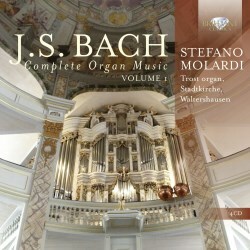 Last year it released the first volume of a new complete recording with the Italian organist Stefano Molardi. Among his credentials is a recording of the complete organ works by Claudio Merulo, a late-renaissance composer from Italy. One of the main issues in regard to the performance of Bach's organ works is the choice of instrument. That is a rather complicated affair. During his life Bach was organist in several places and had different organs at his disposal. He also regularly visited newly-built organs, either to inspect them or to inaugurate them. This means that he became acquainted with various types of organ and as a result there is no such thing as the Bach organ. For this first volume Molardi has chosen the organ in the Stadtkirche 'Zur Gotteshilfe' in Waltershausen. It is one of the main instruments by Tobias Heinrich Gottfried Trost (c1679/81-1759), the most important organ builder in Thuringia in the 18th century, and dates from 1722-41. He also built an organ in Altenburg which received praise from his colleague Silbermann, and also from Bach. In a German internet forum I found a posting which stated that this organ is seldom used for recordings because of its clearly audible action. That is certainly an issue, especially in the more intimate pieces, such as the lento from the Trio sonata in G (BWV 530). The rather close miking only makes it worse. However, it seems to me that there is another reason why this organ is not often used. The acoustic is pretty dry; there is hardly any reverberation, and as a result the sound of the organ can't really blossom. It has its effect on this recording: some short held notes are rather abrupt and non-legato sometimes comes close to staccato. The organ doesn't really breathe, although that is also down to Molardi's playing. There are several ways of recording Bach's organ works. One can concentrate on a specific genre, for instance free works, such as preludes or toccatas and fugues, or a collection of chorale-based works, for instance the Orgelbüchlein. Molardi has opted for a cross-section of Bach's oeuvre: these four discs offer specimens of every genre. The benefit of this approach is to maximise variety, the drawback that pieces are played on one and the same organ which have been written at various stages of Bach's career and may require different organs and different tunings. This organ has a "modified meantone temperament", as the booklet says, but it is questionable whether that is the best tuning for the trio sonatas which date from the late 1720s. The same can be said of the Schübler Choräle which were printed in 1748 and probably date from the late 1730s or early 1740s. These two collections are the only ones which are included here complete, divided over the four discs. One important feature of the trio sonatas is the equality of the three voices. Here the bass is under-exposed, largely due to the weakness of the pedalboard. However, in many movements the right hand is too dominant as an effect of Molardi's choice of registration. For that reason these trio sonatas are largely unsatisfying; there are much better recordings available. The fifth trio sonata (BWV 529) comes off best by far. This is not the only disappointing part of this set, I'm afraid. In fact, there is very little here which I really enjoyed. I don't know why Brilliant Classics thought it necessary to add another complete recording of Bach's organ works to its catalogue, especially as the Fagius is still available. At least this first volume is not better than Fagius - on the contrary. I have compared some pieces and Fagius always came out on top. Molardi's playing is often quite stiff and awkward. It is rather mechanical and not very speech-like. That is especially damaging in the chorale-based works. I also find the registration of various pieces unconvincing, for instance in some of the free works. I don't understand why Molardi makes use of the Cimbelstern in the preludes and fugues BWV 541 and 545. This device is defined in New Grove as "[a] very common toy stop, found mostly in northern Europe c1490–1790 but occasionally elsewhere, and consisting of a revolving star placed towards the top of an organ case to whose wind-blown driving-wheel behind the case is attached a set of bells, tuned or (before c1700) untuned. Mattheson (1713) thought the effect good for feast days." It is often used in music based on Christmas chorales, but its use in preludes and fugues is very unusual. It doesn't add anything substantial to the interpretation. In the preludes and fugues the weakness of the pedalboard is all too obvious and creates a damaging impression. I am surprised by the exaggerated dynamic contrasts which are the result of a change of manuals. That is especially the case in the Toccata BWV 540a. It disrupts its coherence. The majestic gestures of the opening statement are nullified by the odd soft registration. Let me comment on some of the pieces. The Partite diverse sopra O Gott, du frommer Gott (BWV 767) is an example of a piece which suffers from Molardi's mechanical rather than vocal style of playing. In the Fugue in G (BWV 541) the theme is played staccato and in the Fugue in D (BWV 532) the notes are given equal weight, with no differentiation between good and bad notes. In the Prelude in g minor (BWV 535) there is too little differentiation in the figuration. In the arrangement of Vivaldi's concerto Il grosso Mogul (BWV 594) the registration and the style of playing doesn't sit well with the origin of the piece as a work for strings. In the solo episodes in the first movement the accompaniment in the left hand is pretty stiff. In O Mensch, bewein dein Sünde groß (BWV 622) the cantus firmus is not articulated clearly enough. These are just some examples of why this recording didn't satisfy me. Normally there are at least some pieces which I like but in this case there were very few. The Trio sonata in C (BWV 529) is one of the few exceptions. I hope to review the second volume shortly. Maybe that will give me reason to reverse my expectations of this project.